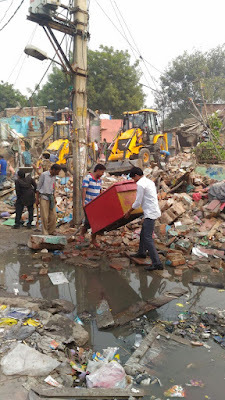 The demolition drive started in the morning and people were given no time, as bulldozers destroyed the homes of hundreds of families. In the face-off between the police and the protesting residents, the former used tear gas and physical force to empty the houses. Young men and children were dragged to the police station, while women faced heavy blows from lathis along with physical abuse at the hands of female constables. Residents were left with no time to pack their belongings as their houses were broken down with all their belongings in them. Around the same time, NFIW general secretary Annie Raja reached the spot and joined the residents to protest against the the demolition drive. Police and DDA officials lathicharged her and dragged her away from the spot and she was gravely injured. The ambulance that had been called for her was not allowed to reach her in time. She was left on the side of the road without any assistance from the police for over an hour. She had to be escorted to the RML hospital with the help of an autorickshaw when she was unable to walk. Last year December, the DDA tried to initiate a similar demolition drive, but residents resisted, saying that they had not been informed about the project which was to be initiated on the spot where they lived, nor did they support it. Failure to give any evidence of consent forced DDA officials to backtrack. 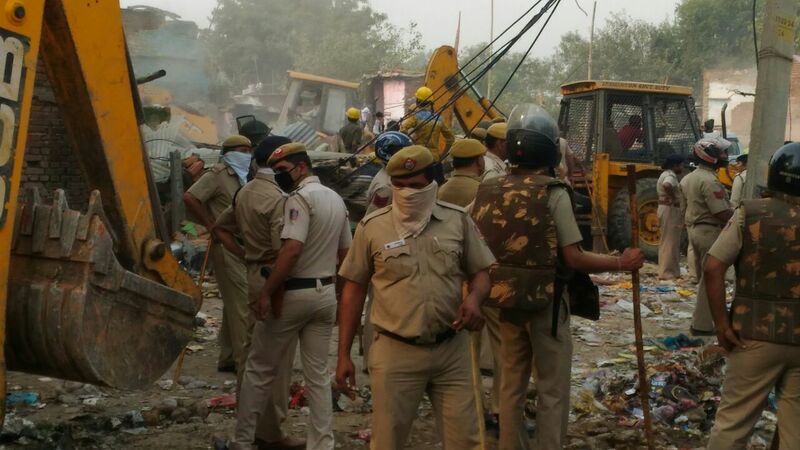 Earlier, the authorities faced strong protests from residents of Kathputli Colony, with some residents representing with the Lieutenant Governor (LG)of Delhi, while a few others filed letters of complaints against the DDA. All that they received in return was the promise that their problem would be taken care of. In a fresh directive, the LG recently ordered a new round of survey, saying that every family that has lived there before 2015 would be included in the final list of those who would be rehabilitated. 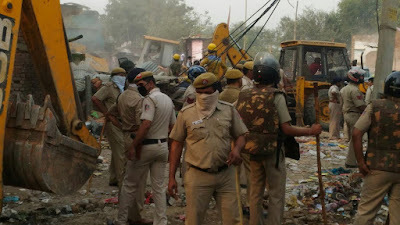 However, in reality, only a few hundred families were surveyed, and, without any mechanism for receiving objections, warning or notice, the police came ready with water cannons and tear gas to demolish the colony and evict the residents. Kathputli Colony is known for award-winning artists who are famous for their art within and outside India. People of different communities from across the country live here collectively. Amidst this the DDA, which is allegedly hand in glove with Raheja Builders, decided, without the consent of residents of Kathputli Colony, to ‘develop’ the colony and its people. However, the project is proving to be destructive for them,with officials and builders wrecking havoc on the people who have lived there for decades.